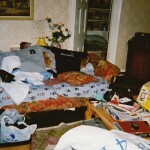 Firstly, this blog goes right back to March 2001. 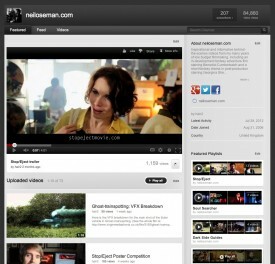 It covers the making of my two micro-budget features, The Beacon and Soul Searcher, from development through to completion and distribution, and the development of my next feature project The Dark Side of the Earth, plus all stages of making that project’s pilot (demo sequence), a large-scale 35mm production starring Benedict Cumberbatch. Over those eleven years I’ve tried to share all the emotional ups and downs, everything I did right and (more frequently) everything I did wrong. There’s plenty for any low budget filmmaker to learn from my experiences, good and bad, and I hope they’ll inspire you as well. For example, you can read about dodging Malvern Hills Conservators to shoot a car chase on a common, how I found a 56 piece orchestra to perform Soul Searcher’s score, what happened when I used a smoke machine while filming in the world’s largest chained library, what it was like to work with Red Dwarf and Doctor Who veteran Mike Tucker on the construction of the Wooden Swordsman, and how slow and difficult it was to shoot on 35mm anamorphic with a relatively small crew. Use the Blog Categories in the righthand sidebar of this page to access the entries from the various stages of each film project. The Films section of this site contains a page for every film I’ve directed, excluding corporate projects. What you might not have noticed is that – in addition to stills, synopses, clips, trailers and behind-the-scenes info – many of these pages have a Downloads section that contains production documents. Want to know what The Beacon’s £3,000 budget was spent on? Or what the schedule for Soul Searcher’s six week shoot looked like? Or how to set out a music cue sheet? Or how closely The Picnic stuck to its shot list? You can find all these things and more. At the time of writing there are 73 videos on my YouTube channel, most of them informative behind-the-scenes or “how to” featurettes. These are organised into playlists according to the film project they relate to, but now for the first time I’ve compiled a list (below) according to subject matter. 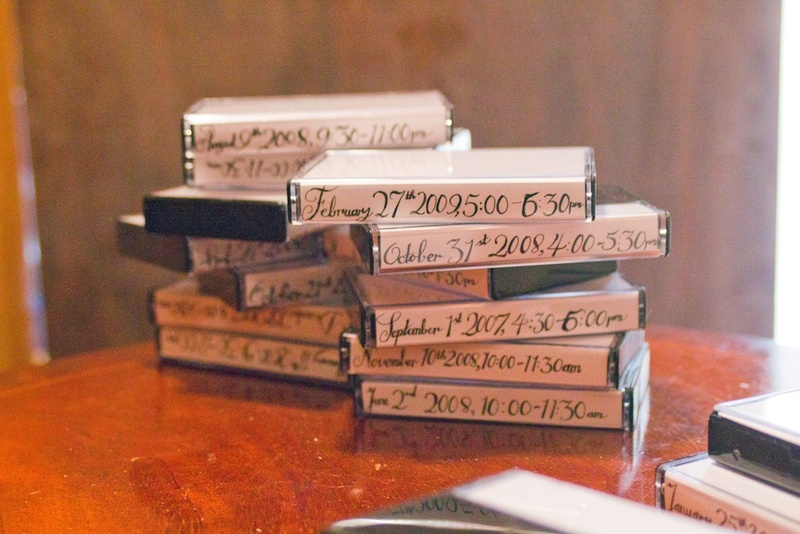 With the exception of the ones in italics, these videos are all free to watch. And remember that every time the total raised for Stop/Eject‘s post-production passes a hundred pound mark we’re releasing public rewards, many of which are behind-the-scenes podcasts. So head on over to stopejectmovie.com and make your donation if you want to see this list grow. This design is by Alain Bossuyt of Le Plan B. Sophie and I felt it would really stand out amongst other movie posters. We loved the retro colour scheme, very similar to that which we used in the movie, and the clever way of combining the romance with cassette-based intrigue. Alain wins two tickets to the premiere and a signed copy of the DVD. His poster will be used to promote the film from now on. Choosing the winner was tough, and there was one design which was just pipped to the post by Alain’s. It’s Jesse Peraza’s entry (right). We thought it would make a great DVD cover, so we’ve awarded it second place. Jesse wins a DVD too. There were other great entries, but we felt these two best represented the tone of the movie. Thanks to everyone who took part. 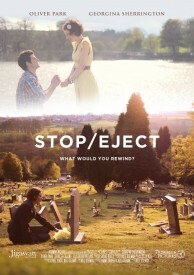 Stop/Eject‘s post-production crowd-funding campaign has been stuck at £440 for a little while now. As gentle encouragement to anyone out there who hasn’t contributed yet, or intended to but has forgotten or just not got around to it yet, here’s a taste of what we went through to make this film. What follows is a record of what it was like to stay and work in Magpie, Stop/Eject’s main location. Lest we forget. First off, let me say thank you once again to Matt Hibbs, who was extremely kind in letting us use his premises not only as a location but as crew accommodation too. I don’t think I’ve ever met such a helpful and laid-back location owner, and without his positive attitude the shoot would have been much more challenging. So nothing that follows should be construed as a complaint. We knew what we were getting into, and we certainly got far more from Matt & co. than we had any right to expect. Magpie once occupied just the ground floor of a four storey Victorian building. 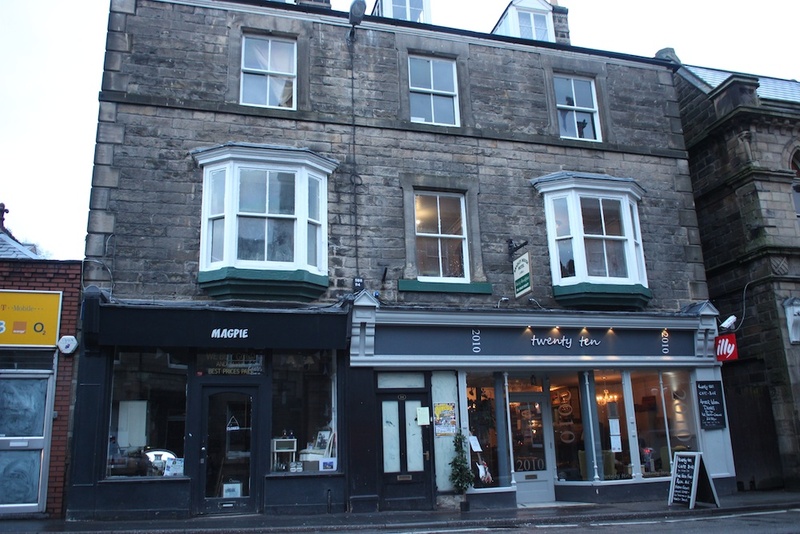 At the time of our shoot (late April), Matt had just purchased the upper floors, formerly a B&B, and was in the process of expanding his shop into them. 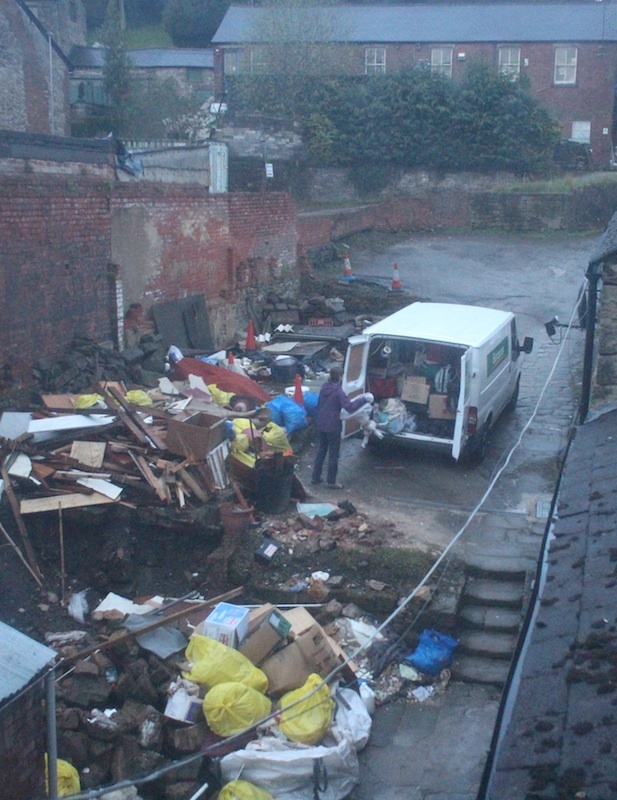 So while the ground floor remained a working shop (and our key location), the rest of the place was a building site. Most of the refurbishment was taking place on the first floor, with the second and third storeys being used, prior to our arrival, for storage of tools and stock. The first thing I noticed when we arrived there the day before the shoot was that it was a lot dustier than I remembered from the recce. Everything was coated in brick dust, which made noses itch, throats dry and eyes water throughout the shoot. Sleeping in the building probably wasn’t very wise from a health point of view, even after Katie had hoovered. Besides Katie and I, Col, Rick and Johnny were staying there too – four nights for most of us. 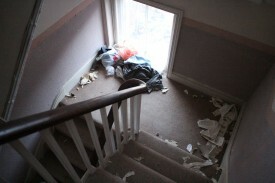 We set up airbeds and sleeping bags in some of the second floor rooms. The first couple of nights there was loud music pumping out of the bar next door. And it was cold. 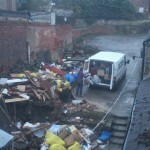 The only radiator we ever found working was on the ground floor, at the back of the shop. Everywhere else was damn chilly by 3am. Not to mention dark. Many of the light fittings had no bulbs in, and torchlight was usually required to find your way around at night. Ablutions were another issue. Matt and his builders had kindly reconnected the plumbing in the second floor bathroom, so in theory we could shower, although stepping out of it into the freezing bathroom was not fun. But after the first night the hot water was found to be leaking into the shop, so Matt had to disconnect it. So it was cold showers, strip-washes or trips to Sophie’s place after that. We brought a fridge with us, lent by Nic Millington, and a microwave and toaster, and Col’s hot plate, so we were able to make rudimentary meals. There was no potable water in the building, so we had to use bottled stuff from Sainsbury’s. We were all very glad when Tuesday arrived and we could shift camp to Sophie’s house. Apart from Johnny, who claimed he got a better night’s sleep at Magpie. There’s no pleasing some people. I encourage you to see our sadomasochistic sojourn at Magpie as a sponsored suffering. 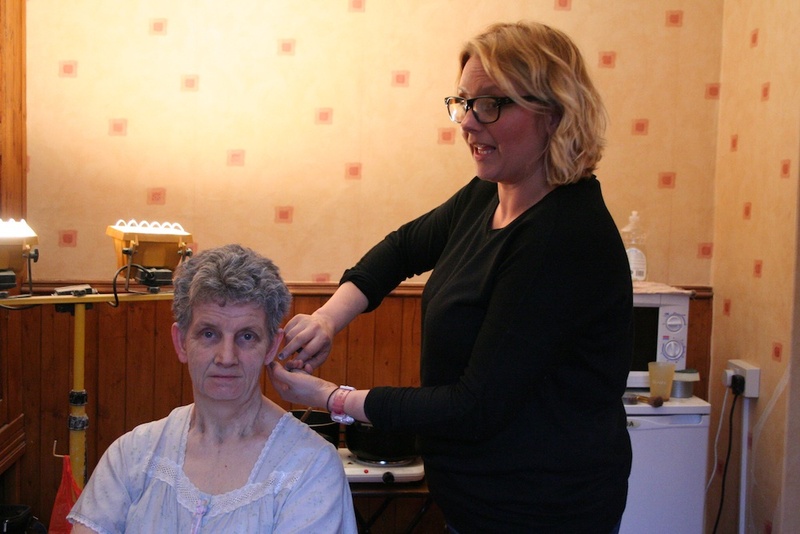 For example, you could sponsor us £5 a night for living in the conditions I’ve just described – that’s £20 total – and you’d get a digital download and an invite to the premiere. Sound like a good deal? 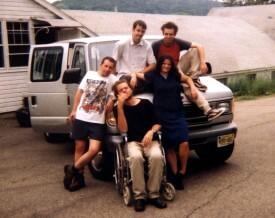 Head on over to stopejectmovie.com and make your donation so we can complete Stop/Eject and make living in Magpie worthwhile. 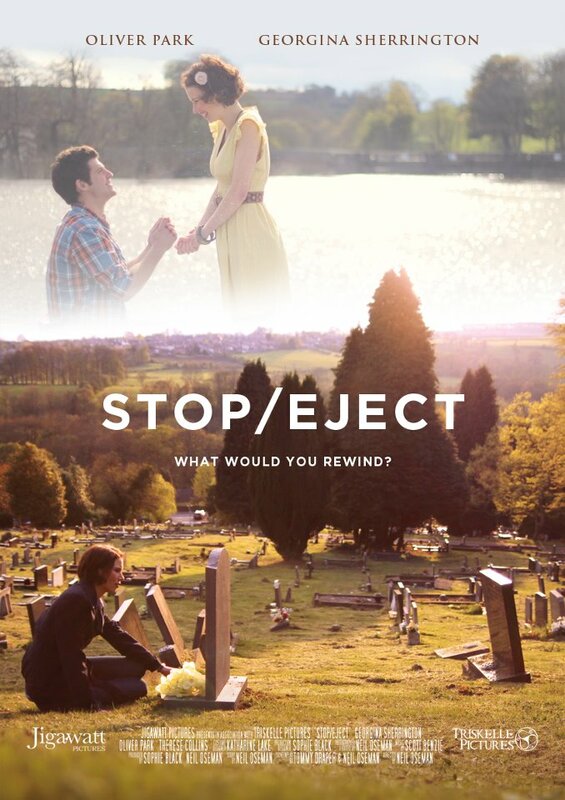 Over the last few weeks, four test screenings of Stop/Eject have been held, at Hereford College of Art, at a friend’s house, at a book club and at The Rural Media Company‘s youth filmmaking group Shoot Out. Thanks to all the hosts and audiences for making these possible. Although these screenings were all small in scale, none of them having more than a dozen attendees, it’s still a large number of screenings, certainly more than I’ve ever done before for a short or even a feature. That fact reflects the level of difficulty in editing Stop/Eject. It’s probably the toughest thing I’ve ever edited. It has very little in the way of plot, but instead relies on a single character arc to propel the film forward. So the audience is dependent on very subtle cues – facial expressions, shot juxtapositions, music – to follow what’s going on. Get one of those wrong and they won’t follow it, and they won’t engage emotionally. 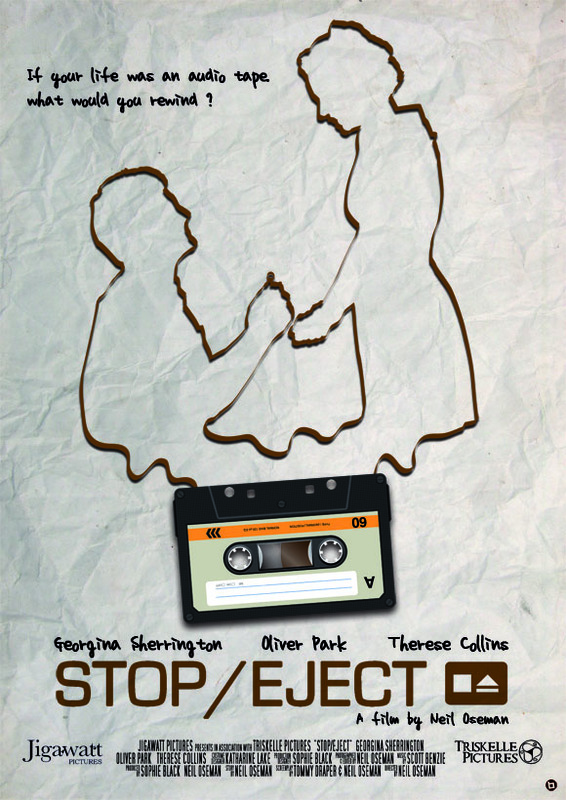 The Stop/Eject screenings revealed the usual things – which scenes were unnecessary or slow, and which moments were confusing. One thing that caught me completely by surprise is that a few people thought one cameo female character was male, which gave them an utterly incorrect interpretation of that scene. That’s when you need to put yourself to the test / And show us a passage of time. The passage of time is something else that the test audiences have struggled to pick up on; many people thought the film was set over a few days. It transpired that seasonal costumes, Christmas lights in the background of a scene and a shot of autumn leaves falling into the river were not sufficient cues. 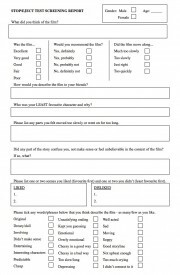 With each successive screening I added more and more cues, and people still weren’t getting it. In the end it was clear that I either had to flash up a title card (“Three months later…”) or take the advice of Team America and use a montage. 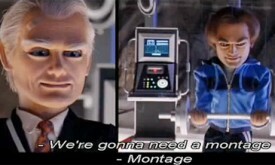 As this song suggests, montages are pretty cheesy, but to my mind they’re less of a cop-out than a title card. Plus a montage allowed me to incorporate shots from deleted scenes, and I always get a kick out of finding new and unexpected ways to use otherwise discarded footage. The montage was inserted for the final test screening, and it must have worked, because no-one thought the events of the film happened over too short a time span. But many of the issues that arose in the screenings were very much foreseen because they came up at script stage. Clearly they weren’t addressed adequately enough back then. One day I’ll learn that you can’t get away with ignoring any problems in your script. They will all come back to bite you in post. Anyway, the edit as it currently stands is pretty good, and I think all involved in the project would be proud of it if I went ahead and locked it now and turned it over to the sound, music and VFX guys. But I don’t think it’s reached its full potential. I think it could be even better, and so does Stop/Eject’s brand new executive producer, Carl Schoenfeld (who will be known to my long-term followers as the producer of The Dark Side of the Earth). 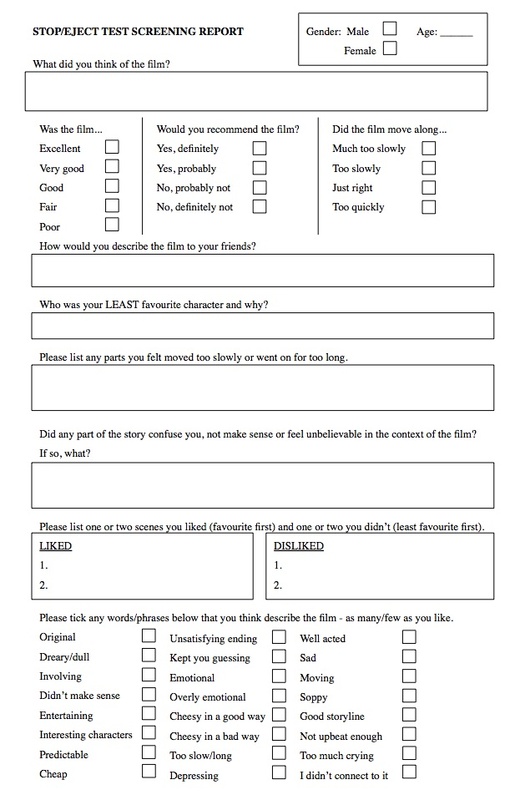 So we’re now on the hunt for another editor who can take the film to the next level. This means post-production will take longer than anticipated; the film won’t be finished in 2012, but it will be the best it can possibly be, and that’s the most important thing. Always fade out at the end of a montage / If you fade out it seems like more time has passed in a montage…. As always, my approach was low-tech, avoiding any CG elements, and I did all the compositing work in Final Cut Pro. Soul Searcher had loads of shots that utilised this low-tech method, creating effects with everything from indoor sparklers to milk being poured into a fish tank. You can see a breakdown of all those effects as part of the Deluxe Package rental of Going to Hell: The Making of Soul Searcher. And remember, if you embed this video on your own site, you get a cut of any sales made through it. 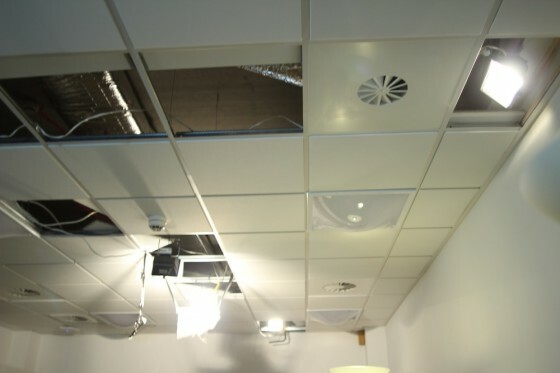 Keeping lights – especially their stands – out of shot can be a real challenge in some locations. 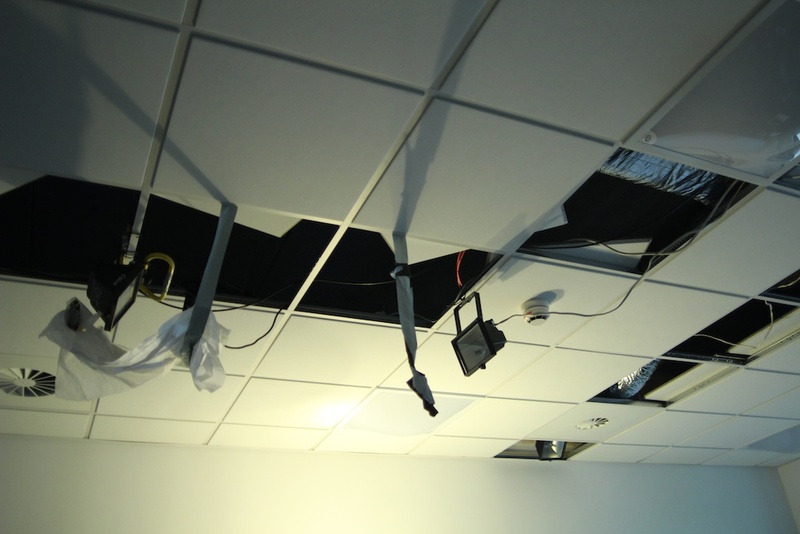 If you’re filming in an office or other type of commercial building, you probably won’t be allowed to screw into the walls or ceilings – but there is another way to hang lamps. If your location has a false ceiling, the kind where polystyrene tiles sit on a metal grid, you can pop some of the tiles out and use heavy duty wire to attach lamps to the metal. I’ve done this on two shoots now, most recently Get It On for Catcher Media, where we had a tight schedule and the director wanted lots of roving handheld shots. Col very kindly lent us his DIY work-lights, which are ideal for this sort of thing because they’re not too heavy. I’d advise you to run separate cables from each lamp to whatever point in the room is least likely to be seen on camera, and from there down to a power socket. Make sure you can unplug any given lamp without having to get up on a ladder, because that will slow down shooting. When you wrap, just untie the wire, unplug the extensions, slide the tiles back into place and no-one will ever know you were there. 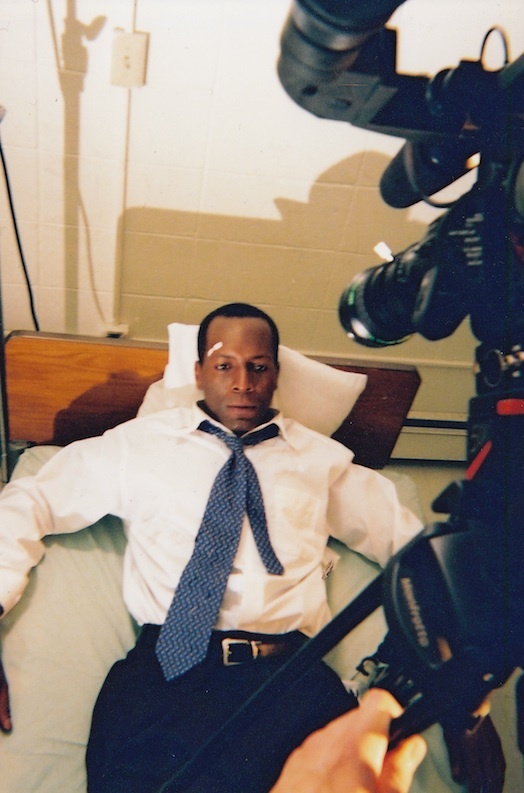 Exactly a decade ago today, I flew out to New York to serve as director of photography on Tom Muschamp’s microbudget thriller Beyond Recognition. It’s the story of Geoffrey Mills, the world’s best plastic surgeon, who gets ensnared in dangerous machinations when he refuses the mafia’s request to alter their don’s face. To this day it remains my favourite of all the shoots I’ve been on. I was 22, I’d made The Beacon (an experience which largely led to me getting the job, I think) but I’d never DPed a feature for another director, and I’d never been to the States before. 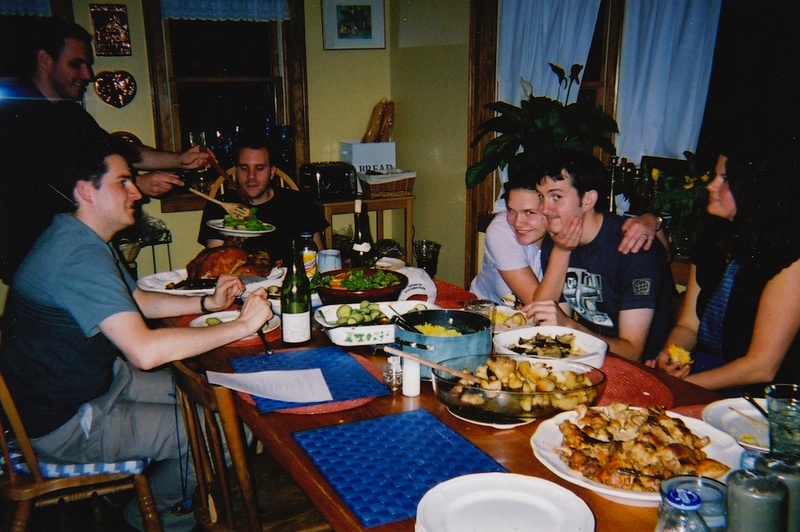 Tom, a Brit, had met an American producer who offered to source all the locations in upstate New York and host the cast and crew at her mother’s house, which was massive in a way that only American houses can be. There is something quite post-modern about the fact that, although I was there to make a film, I was seeing and experiencing things which had hitherto been confined to films for me, like screen doors, root beer and morbid obesity. 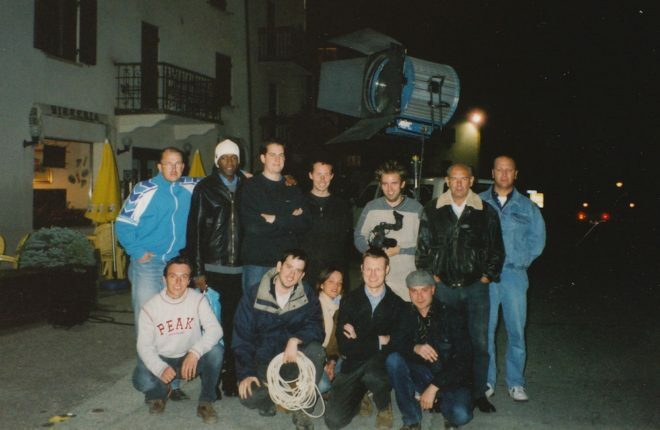 The gaffer, the first assistant director and the runner (Tom’s cousin Ed Reed, who later production-managed Soul Searcher) travelled from the UK with Tom and I, but the cast and the rest of the crew were American. For the most part the atmosphere was fantastic. 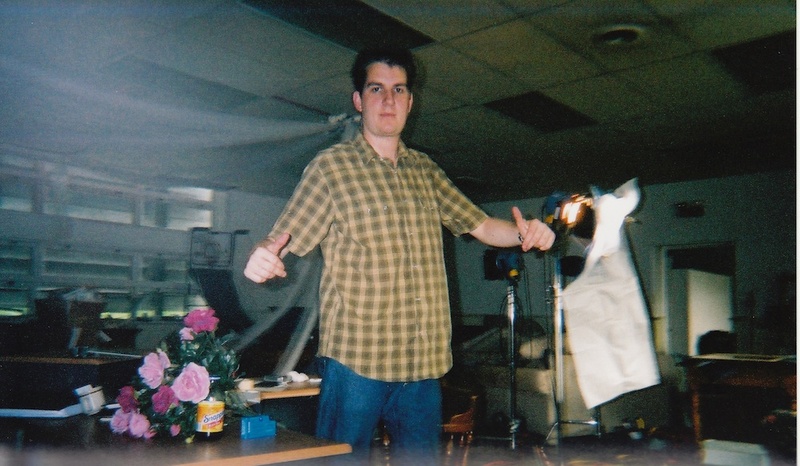 We were all young and enthusiastic and bonding over the trials of shooting an ambitious script with minimal resources in roasting temperatures – in fact “Hot in Here” by Nelly became the anthem of the shoot. Michelle Branch’s “Everywhere” and Avril Lavigne’s “Complicated” also have strong associations with Beyond Recognition for me, as one or other of those songs seemed to be playing on the radio every time we piled into our hired minibus to go to the next location. I’d sent a wish-list of lighting equipment to the production team ahead of time, including several large HMIs and a whole bunch of other kit. When I arrived in New York they said, “Er… well, we’ve got the gels you asked for…” A quick trip to Home Depot was called for. I think that was my first experience of lighting with halogen work-lights, otherwise known as DIY lights. Later Tom splashed out on a set of four Arrilites, which he kindly let me keep at the end of production, and most of which I still have and use to this day. Many scenes were shot in what became known as The Star Building – a small, disused factory in the grounds of the house we were staying in. 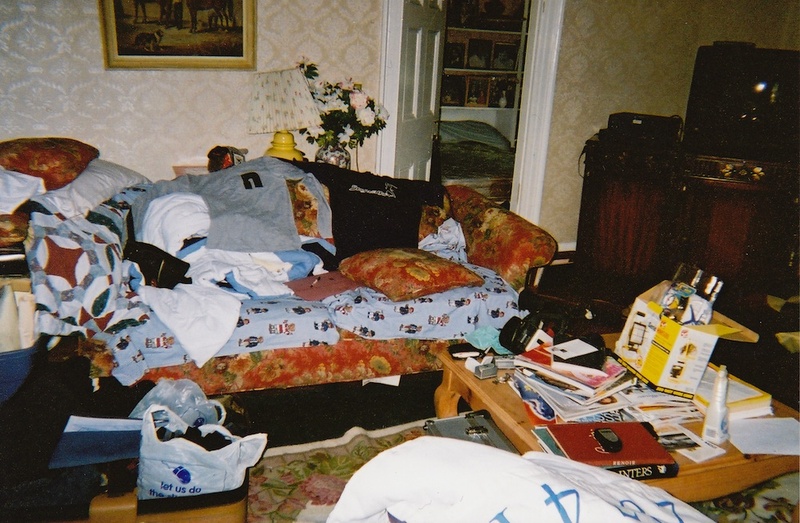 It was full of junk, which we were constantly shifting around to enable us to film in different corners. The toilets didn’t work properly, and I distinctly remember an incident in which the first AD disappeared for a bowel movement, and shortly afterwards some suspiciously brown water started dripping from the ceiling. There was a lot of night shooting, which was great experience for me and helped me develop the Cameron-esque blue look that would define Soul Searcher. When it came to interiors, my memory is that daytime scenes were typically shot at night and vice versa, though God knows why. We were forever blacking out windows or setting up artificial suns. One key thing I learnt from Beyond Recognition is the importance of having your cast and crew sign contracts before you start shooting. The lead actor was very unreliable, but made all kinds of demands once the film was in the can and Tom needed his signature on the dotted line. The lead actress was a bit ditzy as I recall, repeatedly plugging in her hair-drier at a hotel location and blowing the fuse every time because of all the lights we were running. And then there was the actor who, when we needed a bug detector as a prop, said “I’ll bring mine,” and was sent to prison a few years later when he was caught defrauding hundreds of thousands of dollars from a hide-out in the basement of the World Trade Centre. And you think I’m kidding. Crew-wise, we seemed to splinter into two factions towards the end of the three week shoot – those who were happy to do whatever it took to get the movie made, and those who just wanted to moan and slack off (I will never understand why these people sign up to unpaid shoots in the first place). The hours were very long and there wasn’t a single day off in those three weeks, but I’m afraid that’s what micro-budget filmmaking is like. I loved it. Like many Brits returning from the US (especially New York) for the first time, I was quite depressed afterwards and for a few months could think of little other than wanting to return to New York and how much cooler everything is over there. 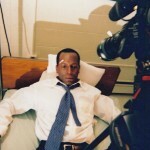 But principal photography on Beyond Recognition was not over when the New York stuff wrapped. Part of the film is set in Italy, and Tom had lined up locations in the picturesque Fai della Paganella in the Dolomites. So on September 29th I was back on a plane, this time to Verona. The crew line-up had changed a bit; strangely the members of the second faction mentioned above were not invited back, and a couple more Brits joined us including Simon Ball and Max Van de Banks, both of whom I’d worked with before and who would go on to work on Soul Searcher. Ed Reed, meanwhile, had been promoted to first AD. The Italian leg of the shoot ran smoother than the US leg, as far as I remember, although we were not popular in the town by the end of the shoot. This was mainly due to the unruly actors, who tended to help themselves to alcohol from the hotel bar (leaving money for it, I should add) and generally act like they owned the place. I finally got my HMIs in Fai. Tom hired two 4Ks from Arri in Milan, which I used to light the town square. 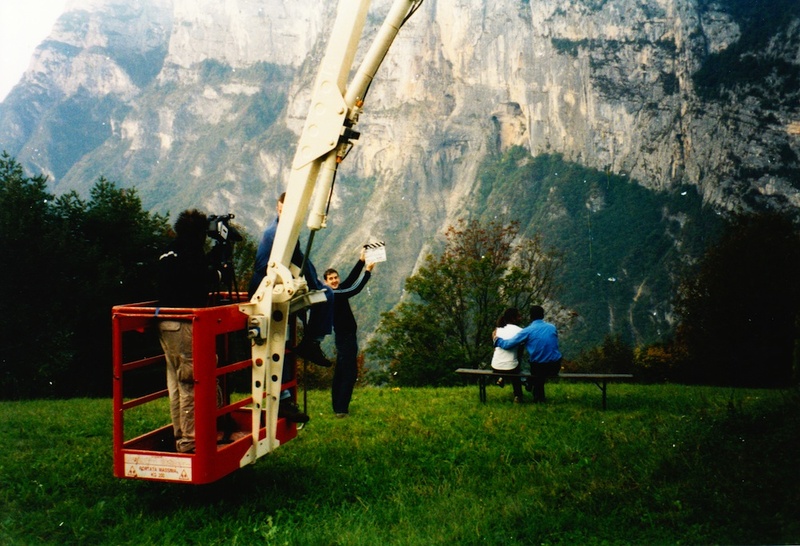 I also got to film a craning shot up in the mountains from a cherry-picker. All in all, the project was an amazing experience for me, and left me with a burning desire to work far more regularly as a DP on indie films, an ambition I sadly still haven’t succeeded in. 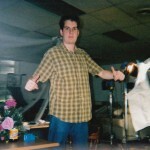 But besides helping shape Soul Searcher, both in terms of its look and Tom’s distribution experiences which I drew on when selling my film, it did lead to other work and in 2007 to my DPing Tom’s second feature, See Saw, on which I met my wife Katie. Beyond Recognition was released on DVD in the US and other territories, but is only available in the UK as an import. I’ll leave you with the trailer. P.S. You can read my original blog entries from the 2002 Beyond Recognition shoot here, here, here and here. 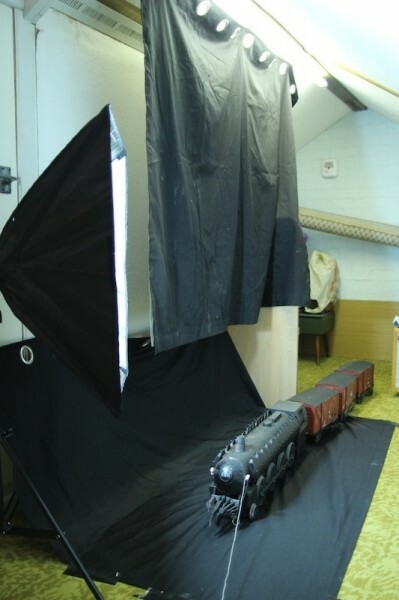 Last weekend I recorded the model shots for Ghost-trainspotting. 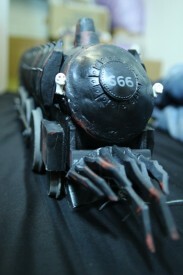 The script was written with the train miniature from my 2005 feature film Soul Searcher in mind. This model was built by Jonathan Hayes, with the wheels and linkages by my uncle and my late grandfather, and even some detailing by Yours Truly. 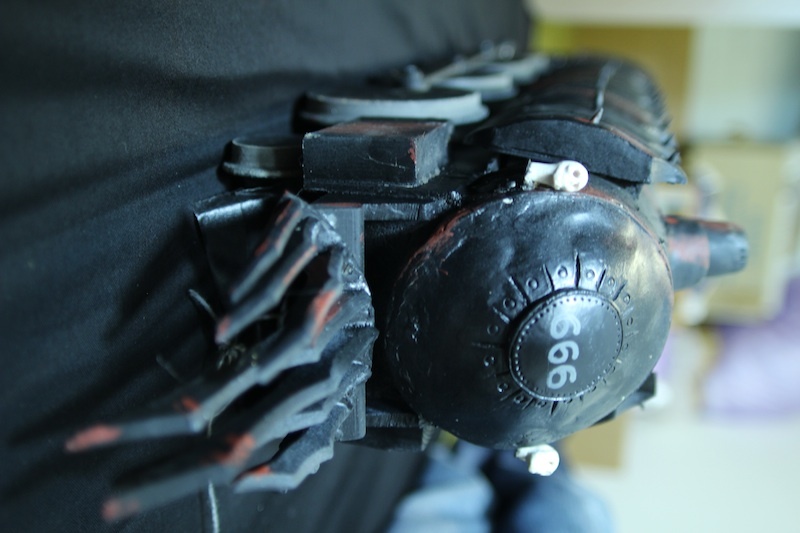 If you’ve seen Going to Hell: The Making of Soul Searcher you’ll know what an absolute pain in the arse this train was to shoot back in the autumn of ’04. You can also check out the key blog entries here, here and here to experience the pain. I’m pleased to report that filming the train this time around was considerably easier. 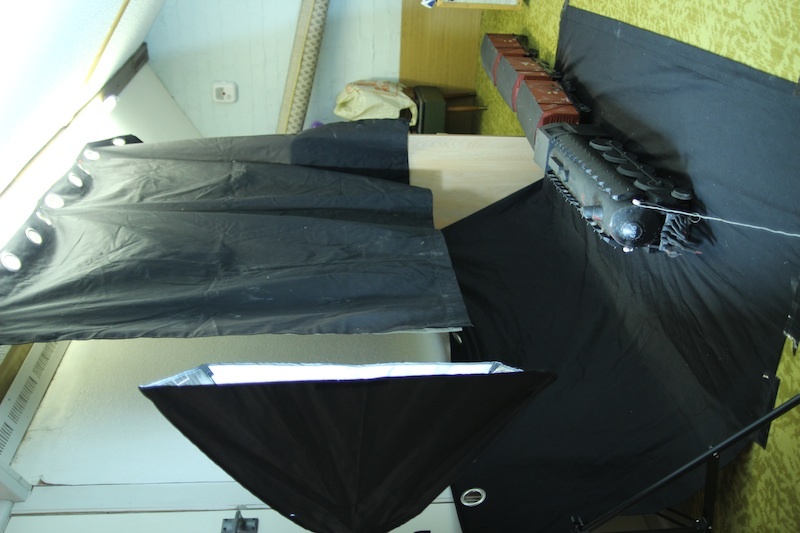 The model has been sitting in my parents’ loft conversion for the last eight years, and that’s where I filmed it. All I had to do was rig some black drapes and line up the camera angles to the live action plates. In the past, whenever I’ve needed to shoot a VFX element that had to match another, pre-existing element, I’ve used acetate. I would play back the existing element, typically a live action plate from principal photography, on a TV or monitor. I’d tape a sheet of acetate – the stuff teachers used to use on overhead projectors – over the screen and draw around the important landmarks with a felt-tip. Then I’d plug the camera into the same TV and adjust the camera angle until it matched the lines on the acetate. Low-tech, but effective. Thanks to Magic Lantern – a firmware hack for the Canon HD-DSLRs – there’s now a more elegant solution. Magic Lantern provides a large number of handy features that Canon themselves were too tight or too lazy to include, but there are only two I regularly use: manual white balance, which lets you dial in the colour temperature in degrees kelvin, rather than relying on presets or holding up a white sheet of paper, and crop marks. On Stop/Eject I used the crop marks to show us the 2:35:1 widescreen aspect ratio we were framing to, but you can actually overlay any monochrome image on the viewfinder by simply creating a .BMP image of the correct specifications on your computer and saving it to your SDHC card. So for Ghost-trainspotting, I loaded still frames from the two live action plates into Photoshop, and outlined them with the paint tool. After saving these outlines to the memory card as bitmaps, I could superimpose them on the Live View image on my Canon 600D’s flip-out screen. This made it a doddle to line up the shots. So, the model shots are now in the can and yesterday I incorporated them into the film. I also tightened up the edit – finally getting it down to 2’20 exactly, including credits – mixed the audio and graded the images. The film is very nearly finished now; I’m just trying to decide whether to change the ending…. 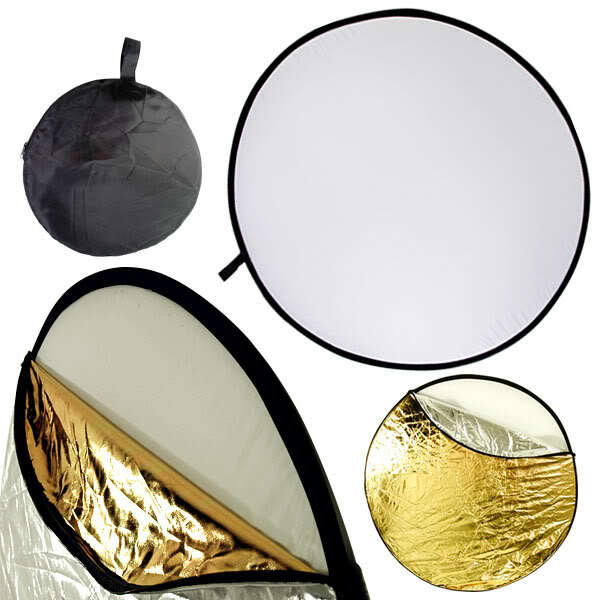 Today I’m going to take a brief look at what you can do to shape natural light when you’re filming outside and you don’t have the budget for big HMIs or massive silks hanging from cranes. Firstly, choose the right direction to shoot in. Work out where the sun is going to be at the time you need to film the scene and decide whether you want to shoot into the light, with your back to it or at an angle. There are iPhone apps that will tell you where the sun’s going to be if you’re too lazy to figure it out for yourself. Remember the sun moves left to right across the sky in the northern hemisphere. Amateur photographers are often told not to shoot towards the sun. This is simply because amateurs will be using auto-exposure, which will close the iris right up as soon as the sun flares into the lens and leave you with a silhouette. As a professional, you’ll be setting your camera manually, so you can expose for the shadows and let the backlight from the sun blow out beautifully. All the evidence you need that shooting towards the sun is good. Out the bottom of frame is a reflector, bouncing some of the sunlight back at the actors – and it’s being wiggled by a crew member to suggest it’s a watery reflection. 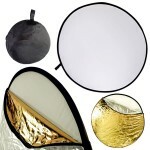 If you don’t have a reflector you should drop what you’re doing and order one now off Amazon. They’re less than £10 and have a reversible zip-off cover giving the options of white, silver or gold surfaces to reflect off, or black to block light. If you remove the cover entirely you’re left with a translucent white disc which can be used to diffuse light, as we’ll see shortly. If you choose to shoot with your back to the sun, you won’t be able to affect the light in your wide shots without big-budget gear, but you can transform your close-ups. Georgina Sherrington (“Kate”) is facing directly towards the sun, which is behind and above camera. As you can see, the light is incredibly harsh and the shadows are so dark that you can’t see her eyes; an effect that would only have got worse had I stopped down to prevent the highlights blowing out. Two reflectors were required to sort this out. The first, with cover removed, was held over her head so that the sunlight hitting her face would have to pass through the translucent material and be diffused. (The diffusion is actually less significant than the amount of light the material blocks.) A second reflector was held out of the bottom of frame, bouncing sunlight back into the shadows on her face and putting a sparkle in her eyes. If it’s a cloudy day – and let’s face it, this is the overwhelming likelihood here in the UK – the above techniques will still work, but much more subtly. If you have access to a power supply, try to set up a lamp to get some eye-sparkle and fill in your actors’ faces. So if you’re DPing a daylight exterior, don’t think that means you can rest on your laurels. It’s still up to you to create the right mood and make the talent look their best.